Tonight Odessa fell asleep on me talking to my mom on Skype. It was so sweet. Especially since today she was not so sweet. First day of no school and I was about to go beat down the doors and demand they reopen for summer session. So I savored the moment and laid there with her mouth hanging open and slobber running down my neck. Made me think of the day back in February I thought the Haitian courts were going to take her away. I never really blogged about my thoughts that day. I asked for prayers, pretty much begged for you all to pray. Before I went in I talked over "the plan" with David. In the event I was arrested he was supposed to call our missionary friends Gwenn and Nick in Jacmel. I called them and told them I had a copy of all of Odessa's adoption paperwork and that if David called them could they take it to the American Embassy. They of course agreed. David's job was to find out where they were putting Odessa. That was out biggest fear. There are no foster homes here and social services is a bit disorganized and overwhelmed to put it lightly. Our biggest fear was that they would take Odessa and then when everything was eventually sorted out (which I knew it would be b/c I had not done anything wrong) we wouldn't be able to find her to get her back. This is a very realistic fear in Haiti. Now I am not going to lie to you and say that I walked into the courtroom full of confidence that God was going to let me walk out with Odessa. But I did walk in with full confidence that my God was bigger than that situation. He is bigger than the judge, bigger than the courts, bigger than the government. That day I was called a "Child Trafficker", in possession of "illegal adoption documents", and was told that I would never be able to adopt Odessa. Odessa's birth mother was present and was questioned on how much money I paid her for Odessa and how much I had promised to give her when the adoption was final. As I started at the judge I just kept thinking, "My God is bigger than you. More powerful. Just. Compassionate"
I hated this man I had never met with such an intense passion. Why was he doing this? My "illegal adoption documents" came from the Haitian courts. And Child Trafficker? Seriously? All the sacrifices I have made for her. (And would gladly do again.) The time I have spent with her. The bond that we have. The promises I have made her. All I heard was, "I'm bigger, more powerful, just and compassionate. Focus on Me." And I know my God is all these things. I came home with Odessa that night and put her to bed and then sat on my bed and started grumbling. Yep you read that right...I started grumbling. It started out as a prayer of thanks but about 2 sentences in I lost it. I told God I couldn't do this anymore. At the time this happened Odessa and I had been together for 21 months. I had been working on required paperwork and been through 2 attorneys and more money than I thought an adoption would cost. And honestly I was just plain tired. I had been to the states for 3 weeks out of the 21 months and frankly was just tired. Needed a break. Without the daily stresses of Haiti and being a foreigner and a single mom to top it off. How could I live knowing that I could be taken to jail anytime the police wanted to check out my paperwork? So the pity party of a prayer continued. Then I felt God answer me. (Kinda cool except He wasn't happy). I didn't hear his voice but I felt Him answer me. He said, "OK. Then quit. No one will blame you. You tried and gave it a good 21 months, nearly got put in prison, you're tired, broke...I get it. So quit. But whatever you do quit complaining about it. I don't want to hear it anymore. No one is forcing you to finish this adoption." So the conversation went on where I explained how I couldn't ever leave her and that's not what I meant. And He explained how I should be thankful for all this time He has given me with Odessa (reminding me that I did miss out on the first 17 months of her life) how not all adoptive parents get the opportunity to raise their child while waiting on an adoption to go through and how bonded we are due to all this time together. So basically what it boiled down to was I got a lecture. One I truly deserved. God never said this journey would be easy. 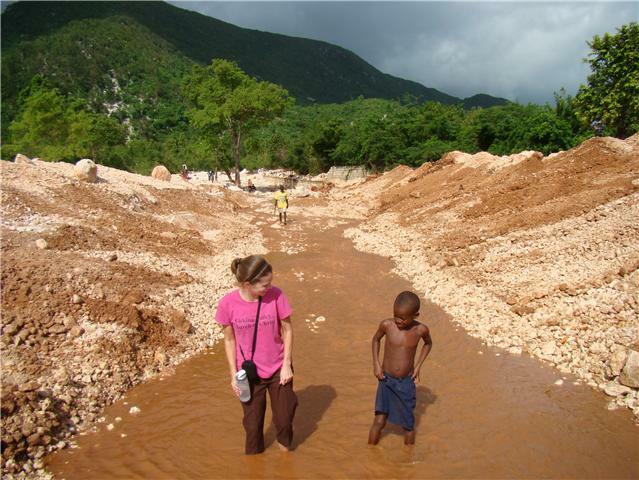 As a matter of fact I have had many people email me saying they were interested in adopting in Haiti and could I give them insight. My insight is this, "Find another country." Seriously. One Haitian lady ever so politely reminded me that in the time I have been waiting to adopt Odessa I could have given birth twice. Yep that made me feel sooo much better! This journey has not been easy. And it's not always fun. I can not imagine it without my big, powerful, just, compassionate God leading the way.